Zinedine Yazid Zidane (French pronunciation: ​[zinedin zidan], born 23 Juin 1972), nicknamed "Zizou", wis the manager o Real Madrid frae 2016 tae 2018, an is a retired fitbawer who played as an attackin midfielder for the French naitional team, Juventus an Real Madrid. Renowned for his elegance, veesion an technique, Zidane wis named the best European fitbawer o the past 50 years bi UEFA, an haes been describit as ane o the greatest players in the history o the gemme. 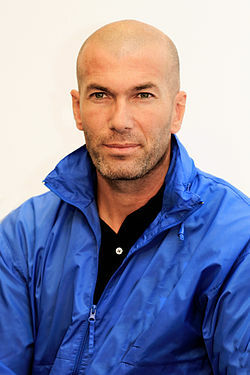 ↑ "Zinedine Zidane set to become Real Madrid director of football". 14 June 2012. ↑ "Zinedine Zidane set to become Real Madrid director of football". The Guardian. London. 7 July 2011. ↑ "Zidane's lasting legacy". BBC. Retrieved 20 April 2013. ↑ "Zidane is greatest football player". ESPN. Retrieved 20 April 2013.